Learn step by step how to make an elegant deco mesh Christmas wreath featuring the popular colors of champagne gold that is so popular this season using two types of mesh, ribbon and silk flowers. This post may contain affiliate links for your convenience. Click here to read my full disclosure policy. Deco mesh wreath are the easiest to master and great for the beginner wreath maker and since deco mesh is inexpensive, you can make a Christmas door wreath for just a few dollars. 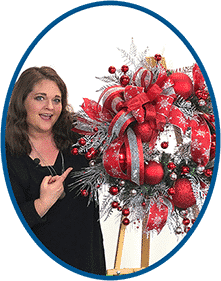 But in this video tutorial, I want to show you how to up your deco mesh wreath making game by using ornaments and silk flowers producing a showstopper wreath for your Christmas door. If you’re ready to add elegance to your home for the holidays, this wreath is for you! Featuring colors like champagne gold, white, silver and softened with greenery, this will make a beautiful addition to your home above a mantel, in your entryway or your front door. 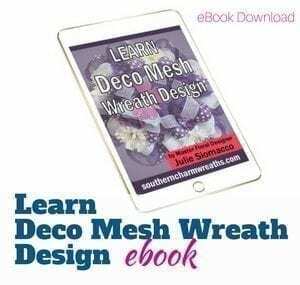 Begin by cutting 12″ long pieces of two types of 10-inch Deco Mesh using a rotary cutter on a clean mat (glue drip free!). I used one roll each of champagne and white. You can stack the Deco Mesh on top of each other to speed up the cutting process. Next, the deco mesh by using the “ruffle technique” and pinching the center of each piece. Do this for three pieces of mesh and secure these three pieces under one of the twist ties. Continue attaching three pieces of deco mesh into each of the twist ties on the wreath until it is filled. Next, Cut 14″ ribbon strips of each of the four ribbons. I use two that are 2.5″ wide and two that are 1.5″ wide for added interest. 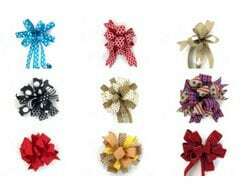 Gather two ribbon strips together, one on top of each other, pinch in the middle and attach to the wreath using one of the existing twist ties. I like to alternate the ribbon patterns as I go. Prepare the larger ornaments by cutting off the hangers and piercing with an awl on each side of the ornament. Then thread through a piece of wire. Use the wire to attach to the wreath frame. I added 3 silver ornaments around the wreath. Next, add the medium or smaller ornaments. For this it was my champagne colored ornaments. Simply thread wire through the hanger and attach to the wreath frame using the wire. Tip: Nestle the ornaments in the ribbon and mesh so that they aren’t sitting on top of the wreath. Now it’s time to add your greenery. Start by cutting apart the greenery stems to separate them out. Then attach in the wreath by adding hot glue to the stems. For the silk flowers, again, cut apart any stems that are too large and attach to the wreath using hot glue on the stems. I added the iced twigs next. These will blow in the wind and add beautiful texture to your wreath. Add hot glue to the stems and attach them around the wreath to fill in. Step back, take a look at your wreath and add greenery or twigs to any areas that need to be filled in. Fluff your ribbon to ensure nothing is laying flat and cut any excess wire sticking out the back. As a result, an Elegant Deco Mesh Wreath for Christmas. That’s it! I hope you loved this step by step deco mesh Christmas wreath tutorial. If you would prefer to use other colors to match your Christmas deco, you can! The steps are the same, just choose what works for you and your décor. Beautiful! Thank you so much for these free tutorials..not everyone is so generous. You rock!! You never said what size you are cutting your mesh!!!! Yes I did. I said 12” and it’s written in the instructions above. Glad you liked the tutorial and thanks for watching and your question! A beautiful elegant wreath anyone should be proud to put up. So gorgeous! 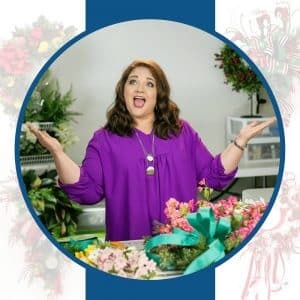 I do have a question…what was that tool you were using at the end of the video on the greenery and, what can you do instead if you don’t have one? Absolutely love your video’s! 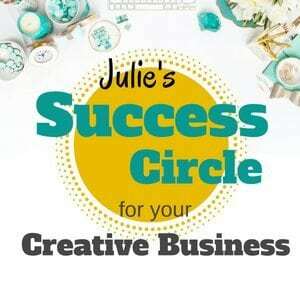 I want to start my own business, part time even though I should be retired I do have to work. So as soon as I have acquired my supplies and tools I am going to give it a shot! Thank you for inspiring me and other’s! How many ties do you use on the double wreath to tie the mesh? Extremely beautiful. And those are the colors on my tree this year, plus pale pink. Thank you. I thought you referred to a company called Trending Tree but I do not see it referenced. Oh my!!! First of all, to take the time to show us step by step the placement of every bulb, pick and flower was truly an early Christmas present. You are so very talented and you have a great eye for placement, and a knack for picking the right combination of mesh, ribbon, flowers and best of all colors! Your wreaths are so beautifully abundant without going overboard. I’ve always wanted to try deco mesh but didn’t know where to start. Now thanks to you, I’m ready!!! When you were working in your florals you put them inside something and pushed a handle down. What is the equipment and why did you use it? Does the fuse two picks together at the stem? Thank you for all your videos, as I am a newbie to wreath making. I love watching your videos! I would love to make this exact wreath. Does it come in a kit to purchase?